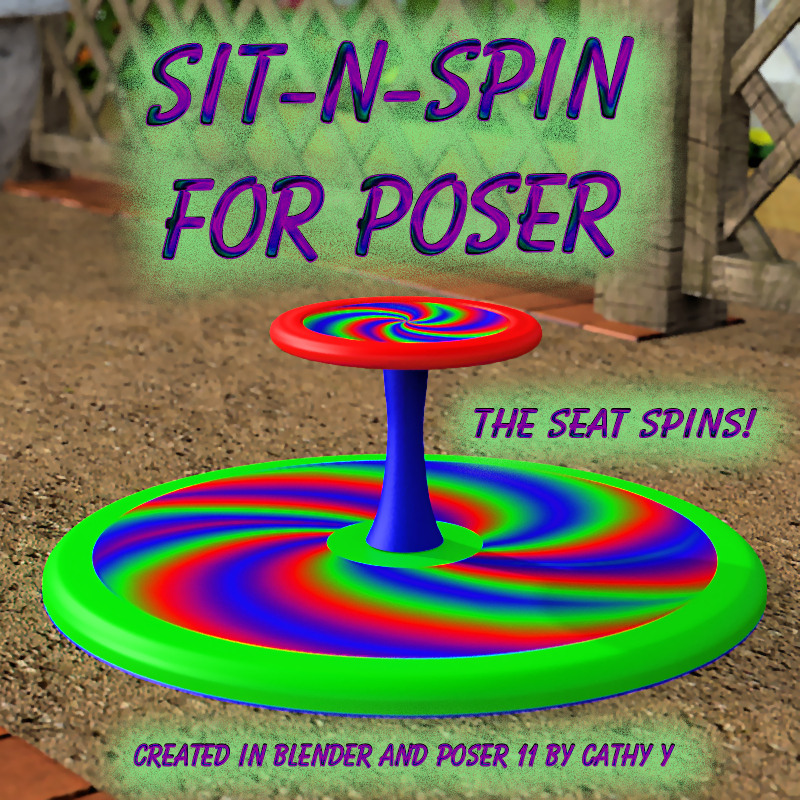 ************************************************************ *Product Name: Sit-n-Spin *By: CathyY *Contact: cjeromehar@yahoo.com ************************************************************ Thank you for downloading my free Sit-n-Spin. I hope you enjoy it. This product contains: - 1 Sit-n-Spin in pp2 format. - Six mix-n-match colors for each section: base, post, seat and wheel. -12 mix-n-match designs for the seat and wheel label/paint. -------------------------------------- System Requirements: - Poser 11+ May work in earlier versions -------------------------------------- Installation Instructions: - To install this product, Copy the runtime folder into your Poser content folder. Each file will automatically be put in the correct place. -------------------------------------- Instructions for Use: - The seat is a separate section parented to the base. It can be posed by using the spin dial. - To apply colors and designs to your Sit-n-Spin: - All colors and designs are in the materials folder. - Make sure that you have the correct part selected (e.g.- Base01 to Base and SeatPaint02 to SeatPaint) . Each part uses different ratios for the textures. -Because it's in two parts, it's important to make sure you have the correct part selected. The base, post, wheel and wheel label are used on the base figure and the seat and seat paint are used on the seat figure. -------------------------------------- Ownership Statement: All of the content in this package was created by Cathy Y in Blender and Filter Forge. -------------------------------------- USAGE: Personal and commercial renders are fine. These files are not to be sold! Do not share these files without my permission. You can change it around all you want. Just don't claim credit for the original files. DO NOT put it on Second Life or any of their ilk. -------------------------------------- Detailed Product Features: This product features: - One Sit-n-Spin prop with spinning seat. - Six material files each for the base, seat, post and wheel. - 12 sets of textures for the seat and wheel paint/label. -------------------------------------- Tips and Tricks: You can parent your figure to the seat for spinning animations. -------------------------------------- Files Included in the Product: \Runtime\Documentation\CathyY\Sit-n-Spin_Poser\ CY Sit-n-Spin Poser Read-Me.txt \Runtime\Geometries\CathyY\Sit-n-Spin\ SnS Base.obj SnS Seat.obj SnS Base.mtl SnS Seat.mtl \Runtime\libraries\Materials\CathyY\Sit-n-Spin\Base\ Base01.mt5 Base01.png Base01.xmp Base02.mt5 Base02.png Base02.xmp Base03.mt5 Base03.png Base03.xmp Base04.mt5 Base04.png Base04.xmp Base05.mt5 Base05.png Base05.xmp Base06.mt5 Base06.png Base06.xmp \Runtime\libraries\Materials\CathyY\Sit-n-Spin\Post\ Post01.mt5 Post01.png Post01.xmp Post02.mt5 Post02.png Post02.xmp Post03.mt5 Post03.png Post03.xmp Post04.mt5 Post04.png Post04.xmp Post05.mt5 Post05.png Post05.xmp Post06.mt5 Post06.png Post06.xmp \Runtime\libraries\Materials\CathyY\Sit-n-Spin\Seat\ Seat01.mt5 Seat01.png Seat01.xmp Seat02.mt5 Seat02.png Seat02.xmp Seat03.mt5 Seat03.png Seat03.xmp Seat04.mt5 Seat04.png Seat04.xmp Seat05.mt5 Seat05.png Seat05.xmp Seat06.mt5 Seat06.png Seat06.xmp \Runtime\libraries\Materials\CathyY\Sit-n-Spin\Wheel\ Wheel01.mt5 Wheel01.png Wheel01.xmp Wheel02.mt5 Wheel02.png Wheel02.xmp Wheel03.mt5 Wheel03.png Wheel03.xmp Wheel04.mt5 Wheel04.png Wheel04.xmp Wheel05.mt5 Wheel05.png Wheel05.xmp Wheel06.mt5 Wheel06.png Wheel06.xmp \Runtime\libraries\Materials\CathyY\Sit-n-Spin\SeatPaint\ SeatPaint01.mt5 SeatPaint01.png SeatPaint01.xmp SeatPaint02.mt5 SeatPaint02.png SeatPaint02.xmp SeatPaint03.mt5 SeatPaint03.png SeatPaint03.xmp SeatPaint04.mt5 SeatPaint04.png SeatPaint04.xmp SeatPaint05.mt5 SeatPaint05.png SeatPaint05.xmp SeatPaint06.mt5 SeatPaint06.png SeatPaint06.xmp SeatPaint07.mt5 SeatPaint07.png SeatPaint07.xmp SeatPaint08.mt5 SeatPaint08.png SeatPaint08.xmp SeatPaint09.mt5 SeatPaint09.png SeatPaint09.xmp SeatPaint10.mt5 SeatPaint10.png SeatPaint10.xmp SeatPaint11.mt5 SeatPaint11.png SeatPaint11.xmp SeatPaint12.mt5 SeatPaint12.png SeatPaint12.xmp \Runtime\libraries\Materials\CathyY\Sit-n-Spin\WheelLabel\ WheelLabel01.mt5 WheelLabel01.png WheelLabel01.xmp WheelLabel02.mt5 WheelLabel02.png WheelLabel02.xmp WheelLabel03.mt5 WheelLabel03.png WheelLabel03.xmp WheelLabel04.mt5 WheelLabel04.png WheelLabel04.xmp WheelLabel05.mt5 WheelLabel05.png WheelLabel05.xmp WheelLabel06.mt5 WheelLabel06.png WheelLabel06.xmp WheelLabel07.mt5 WheelLabel07.png WheelLabel07.xmp WheelLabel08.mt5 WheelLabel08.png WheelLabel08.xmp WheelLabel09.mt5 WheelLabel09.png WheelLabel09.xmp WheelLabel10.mt5 WheelLabel10.png WheelLabel10.xmp WheelLabel11.mt5 WheelLabel11.png WheelLabel11.xmp WheelLabel12.mt5 WheelLabel12.png WheelLabel12.xmp \Runtime\libraries\props\CathyY\Sit-n-Spin\ Sit-n-Spin.png Sit-n-Spin.pp2 Sit-n-Spin.xmp \Runtime\libraries\Textures\CathyY\Sit-n-Spin\ SeatPaint01.jpg SeatPaint02.jpg SeatPaint03.jpg SeatPaint04.jpg SeatPaint05.jpg SeatPaint06.jpg SeatPaint07.jpg SeatPaint08.jpg SeatPaint09.jpg SeatPaint10.jpg SeatPaint11.jpg SeatPaint12.jpg SnS Bump.jpg SnS Diffuse.jpg WheelLabel01.jpg WheelLabel02.jpg WheelLabel03.jpg WheelLabel04.jpg WheelLabel05.jpg WheelLabel06.jpg WheelLabel07.jpg WheelLabel08.jpg WheelLabel09.jpg WheelLabel10.jpg WheelLabel11.jpg WheelLabel12.jpg Enjoy! Enjoy the memories of your childhood with a sit-n-spin that will actually spin.